Recently, I got some samples of flax seeds from King Arthur Flour for answering a survey, and decided to use both the regular flax and the golden flax the same loaf of bread. The flax that I ground and put into the bread was the golden flax, but I put both types on top of the loaf, with half covered with the lighter and half covered with the darker. I figured that would let me taste them individually and see if I liked one more than the other. To be honest, I didn't taste a big difference between the two, but I like the color options. The darker brown would be great on a golden crust, and the light ones would be pretty on a dark crust. Of course, a mix of the two would also be great. Put the bread flour, semolina, salt, honey crystals, yeast, and ground flax into the bowl of your food processor. Pulse several times to combine the ingredients. With the processor running, add the water as fast as the flour can absorb it, then continue processing until the dough forms a ball, and then another 30 seconds. Drizzle some olive oil into a zip-top bag. Form the dough into a ball and place it in the bag, turning to coat it completely with the oil. Refrigerate the dough overnight. The next day, take the dough out of the refrigerator, and massage it briefly, still the the bag, to knock the air out of it. Let it sit on the counter for 2-3 hours, until it has come up to room temperature. Sprinkle a baking sheet with cornmeal and preheat the oven to 350 degrees. Flour your work surface and turn the dough out. Knead the dough briefly, then form it into your desired loaf shape. Place it on your prepared sheet, cover with plastic wrap, and set aside to rise until doubled, about 40 minutes. Brush the loaf with the egg wash or spray with the Quick Shine. Sprinkle with the flax seeds, then slash, as desired. Bake at 350 degrees until golden brown, about 40 minutes. * Quick Shine is a spray product that helps seeds adhere to the top of a loaf, and makes it shiny. Egg wash (1 egg beaten with a tablespoon of water) will do the same thing. The egg is the more natural item, but it might also be a bit wasteful, if you don't have another use for the rest of it - you don't use much on one loaf of bread. Hi Donna! I wanted to invite you to sit in on a private food speaker series. A few cool food influencers are speaking in Boulder in March for a small group of attendees. What a beautiful loaf. The interior looks so soft! I also have both kinds of flax seeds but can't tell the difference between the two in taste. One question for you, if you don't mind: what are honey crystals? Could I substitute liquid honey for it? Thanks! I just read through your Bread Ingredients page and had one of my questions answered :o) If I were to sub liquid honey for the honey crystals, how much do you think I should use? Thank you. Hanaa, you read fast:-) Honey crystals are as sweet as honey, so use the same amount. You're adding a little more liquid, but it's not enough to make a difference. Thanks Donna. 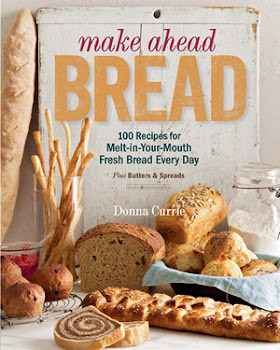 I like semolina flour and flax seeds in bread so I'm bookmarking this one for sure :o) Oh, and I love that your recipe has weight measurements (I haven't baked w/o my scale in years). I just wanted you to know I made your semolina braid bread...the recipe you have posted over at Serious Eat. Thanks for letting me know, Sheila! I'm glad you like the bread. Semolina flour is my secret ingredient for a lot of the breads I make. It's great stuff. Donna, wanted to let you know I made this bread last week and it was a big hit. It was gone in 2 days :o) I made a couple tweaks: use 2Tbsp of liquid honey and a little vital wheat gluten. It's my plan to post pictures of the bread on my blog (with a link to yours). Will let you know when it's up, in case you're interested. I'm glad you liked it, and yes, let me know when it's posted. I always like it when people try my recipes and they work out and little tweaks are what make them special, right? Hi. Glad to find a recipe using semolina flour. It was recommended to me as a way to lighten my loaf but I looked through several usually very helpful cookbooks and came up with zilch. I'm wondering, for clarification, is the 1 T. olive oil just for oiling the bag, or is it supposed to be added with the water? Many thanks! I have several other recipes here that use semolina flour - I really like it. As far as the oil, in this case it's just for oiling the bag, but if you want to add a tablespoon of oil to the dought, that's fine, too. It would work either way. Thanks!! Letting it come to room temp now - will report back. What the Heck is Chourico?